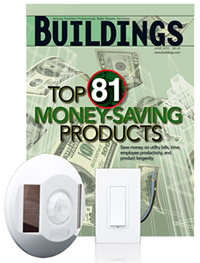 Leviton Manufacturing Company‘s LevNet RF™ line of lighting controls was selected by Buildings Magazine as one of its Top 81 Money-Saving Products. In selecting their top picks in the category, buildings editors took into account criteria such as: initial cost, life-cycle costs, sustainability, longevity, energy efficiency, occupant productivity and maintenance requirements. LevNet RF, along with 80 other products that help companies operate more profitably, was profiled in the June issue, Product features such as LevNet RF’s suitability for installation in a wide range of commercial retrofit applications, self-powering feature, signal transmission range of up to 150 feet and its ability to operate without batteries or new wires were highlighted in the issue. The revolutionary line of self-powered, eco-friendly lighting control devices integrates Leviton’s signature performance and design features with best-in-class technology from EnOcean, the world leader in wireless control technology. Without wires to run, LevNet RF devices reduce labor and material costs, and require only minutes to configure. Once installed, LevNet devices can be used in virtually any commercial retrofit environment to control energy consumption and reduce a facility’s carbon footprint. LevNet RF™ devices recently were awarded Design Journal Magazine’s 2010 ADEX (Award for Design Excellence) Platinum level award, ECM’s 2010 Product of the Year Award. LevNet RF was also named Buildings” Top 100 Products for 2009. Leviton Manufacturing Company is a leading global manufacturer of electrical wiring devices, data center connectivity solutions and lighting energy management systems. Founded at the turn of the 20th century, Leviton has grown to become one of the most preeminent leaders in the electrical industry. Today Leviton’s product portfolio consists of over 25,000 devices and systems used in homes, businesses and industry. Nine out of ten homes throughout North America have Leviton products installed in them. Builders, electrical contractors and other industry professionals rank Leviton products #1 in brand preference.